Collectable collectible birthday gift present boys girls ladies gents age related teddy teddies gifts presents birthday soft toy toys wildlife wild animals pets life like mountains peru peruvian creatures cuddlies cute plushies. UK Stockist Offering The Largest Selection Of HANSA. Not Just A Soft Toy A Work Of Art In Plush! A magnificent dragon with great attention to detail. He has airbrushed highlights that accentuate his features, from the ribbing effect down his neck to the facial expression and along his wing. He is made to the highest standards from the finest materials (synthetic plush and poly fibre filling) and carries the CE label so she is safe for children (not under 36 months) and is surface washable. 15" (38cm) tall and 32" (81cm) long and 30 (76cm) wingspan. BRAND NEW AND COMPLETE WITH TAGS. LINCRAFTS have been a soft toy stockist since 1993. Many more HANSA animals in our shop, so why not pay a visit, you might be glad you did! Be sure to add me to your favorites list. 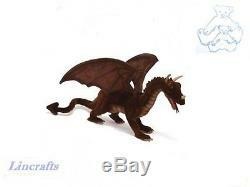 The item "Large Dragon Plush Soft Toy Mythalogical Creature by Hansa from Lincrafts. 4929" is in sale since Friday, January 17, 2014. This item is in the category "Toys & Games\Soft Toys & Stuffed Animals\Branded Soft Toys". The seller is "lincrafts" and is located in Lincolnshire. This item can be shipped worldwide.